It’s back to school season and that means life (especially mornings) is hectic once again. Your mind may immediately go to school shopping, lunch making, homework help, and after-school activities that are now back on the schedule when you think about back to school season, but have you thought about your home? After a structureless summer, your home will benefit from some strategic organization. Follow these four simple tips for some key areas in your home to get your house ready for the new school year. Clear the entryway: Whether it’s the front door or a side door, the main entry your kids use often becomes a magnet for all the things: backpacks, jackets, shoes, lunchboxes. Reclaim this space by encouraging everyone to use a “drop zone” away from the entry door to place their belongings when they get home, whether it’s their bedrooms or another communal space (whichever works best for your family). Some families use their entry way as a launch pad for the morning departures, allowing kids to place their backpacks and lunchboxes nearby ready to grab on their way out the door. Clean out the closets: Unless your children wear uniforms, figuring out what to wear can be a daily battle. Dodge this tussle by helping younger kids pick out their outfits the night before (or all week). Also, be sure to review their wardrobes and remove items that no longer fit, they no longer wear, or are out of season. Set up a homework station: Encourage proper study habits by creating a comfortable and organized study area that’s stocked with homework supplies they’ll need. Whether it’s a desk in their bedroom or a common room, pick a place where your child feels most comfortable working in. Sometimes that means the kitchen table. If your kid prefers working at the kitchen table, consider using a rolling cart to hold extra school supplies that can be neatly rolled away when they’re finished working. Streamline the kitchen: The kitchen is the hub of the home and the morning chaos as the family tries to leave the house. Make mornings a little bit smoother by doing some prep work: gather your lunch-making supplies in one area, including lunchboxes so you don’t have to root around the kitchen looking for a container. Stock your fridge and pantry with healthy, self-serve items your kids can grab to fill out their lunches. This also works for easy grab-and-go breakfasts and after-school snacks. 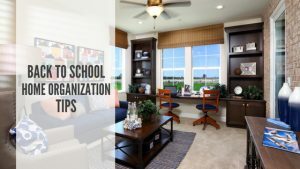 Each new school season brings its own unique challenges but taking a little time now to get your home organized will help you ace this school year.